Reverend Muao Su’a officially opened the new season with a prayer followed by the Women’s National League shield match between Vaimoso SC and Adidas SC. Vaimoso SC are off to a flying start, walking away with a hat trick of victories. The Women’s National League shield holders were able to defend their title with a win over Adidas 2-1. They also came out as winners in the Men’s First Division, defeating Unity 2-1 and are at the top of the Men’s Premier League club standings after hammering One Way Wind 6-0. 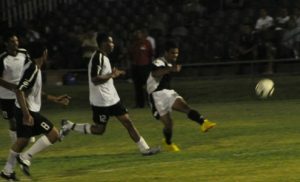 Football veteran and President of Vaimoso SC, Malo Vaga was happy with his club’s performance. “It’s a great start to the season for us and I hope it continues”, he said. “All thanks to God for giving us the strength to play well and come out with positive results”. 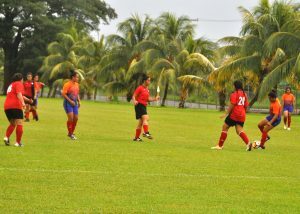 Central United FC lead the Women’s National League club standings after defeating newcomers Vaiusu 7-0. Striker Seifono Misili’s game was on point, scoring three of Central’s winning goals. Moaula SC kept Men’s National League champions Vailima Kiwi on their toes, resulting in a draw 2-2 while Lupe o le Soaga held onto the shield with a win over Men’s National League amateurs Vaitoloa FC 4-1. 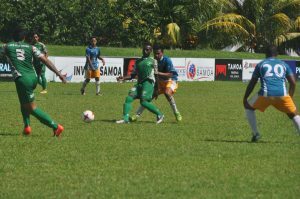 The National League will kick off in Savaii this coming Saturday with eighteen teams registered to compete in this season’s competition. Week 2 of the Upolu National League sees Vailima Kiwi FC who are currently leading the Men’s First Division club standings up against YWAM, followed by their female counterparts who will be versing Central United FC in the Women’s Premier League. The final Men’s Premier League match of the day will be one to look out for as shield holders Lupe o le Soaga take on Men’s National League champions Vailima Kiwi FC. All games will be held at the Football Federation Samoa grounds in Tuanaimato on Saturday 8th November, 2014.